the muscular and cartilaginous structure, lined with mucous membrane, situated at the top of the trachea and below the root of the tongue and the hyoid bone; it contains the vocal cords and is the source of the sound heard in speech. The larynx is part of the respiratory system; air passes through it traveling from the pharynx to the trachea on its way to the lungs and again returning to the exterior. The larynx is composed of nine cartilages that are held together by muscles and ligament: the single thyroid, cricoid, and epiglottic cartilages and the paired arytenoid, corniculate, and cuneiform cartilages. (See also color plates.) The largest of these, the thyroid cartilage, forms the Adam's apple, which protrudes in the front of the neck. Two flexible vocal cords reach from the back to the front wall of the larynx and are manipulated by small muscles to produce sound. The epiglottis, a flap or lid at the base of the tongue, closes the larynx as it is lifted up during swallowing and so prevents passage of food or drink into the larynx and trachea. artificial larynx an electromechanical device that enables a person after laryngectomy to produce speech. When the device is placed against the region of the laryngectomy a buzzing sound is made that can be converted into simulated speech by movements of the lips, tongue, and glottis. Called also electrolarynx. (lar'ingks, lă-rin'jēz), Avoid the misspelling/mispronunciation larnyx. The organ of voice production; the part of the respiratory tract between the pharynx and the trachea; it consists of a framework of cartilages and elastic membranes housing the vocal folds and the muscles that control the position and tension of these elements. /lar·ynx/ (lar´inks) pl. laryn´ges [L.] the organ of voice; the air passage between the lower pharynx and the trachea, containing the vocal cords and formed by nine cartilages: the thyroid, cricoid, and epiglottis and the paired arytenoid, corniculate, and cuneiform cartilages. The part of the respiratory tract between the pharynx and the trachea, having walls of cartilage and muscle and containing the vocal cords enveloped in folds of mucous membrane. the organ of voice that is part of the upper air passage connecting the pharynx with the trachea. It accounts for a large bump in the neck called the Adam's apple and is larger in men than in women, although it remains the same size in men and women until puberty. The larynx forms the caudal portion of the anterior wall of the pharynx and is lined with mucous membrane that is continuous with that of the pharynx and the trachea. The larynx extends vertically to the fourth, fifth, and sixth cervical vertebrae and is somewhat higher in women and children. It is composed of three single cartilages and three paired cartilages, all connected by ligaments and moved by various muscles. The single cartilages are the thyroid, cricoid, and epiglottis. The paired cartilages are the arytenoid, corniculate, and cuneiform, which support the vocal folds. Also called voice box. laryngeal, adj. The region of the throat between the pharynx (tip of the epiglottis) and trachea (cricoid cartilage) which contains the vocal cords and is involved in breathing, swallowing, and speech. • Superolateral boundary—Tip of the epiglottis and aryepiglottic folds. • Inferior limit—Inferior rim of the cricoid cartilage. • Posterior limit—Posterior mucosa covering cricoid cartilage, arytenoid region, and interarytenoid space. • Anterior limit—Lingual surface of epiglottis, thyrohyoid membrane, anterior commissure, thyroid cartilage, cricothyroid membrane, and anterior arch of the cricoid cartilage. The organ of voice production, which also serves a protective function for the airway; the part of the respiratory tract between the pharynx and the trachea: it consists of a framework of cartilages and elastic membranes housing the vocal folds and the muscles that control the position and tension of these elements. The framework of the larynx is built of three single cartilages and three paired cartilages. The unpaired cartilages are: the cricoid cartilage, a thick cartilage ring on top of the trachea; the thyroid cartilage, a V-shaped cartilage that sits on the cricoid with the point of its 'V' facing forward; and above this, the epiglottic cartilage, shaped like an upright paddle, with its handle held inside the front angle of the thyroid cartilage. The three smaller paired cartilages are: the arytenoids, the corniculates, and the cuneiforms. These nine cartilages are held together by membranes and ligaments, usually named by the structures that are interconnected; for example, the cricothyroid membrane connects the front of the cricoid cartilage with the base of the thyroid cartilage in the midline. The intrinsic muscles of the larynx -- cricothyroid, posterior cricoarytenoid, lateral cricoarytenoid, thyroarytenoid, transverse and oblique arytenoids, and vocalis -- alter the length and tension of the vocal cords and the size and shape of the opening between them (the rima glottis). The vagus nerve supplies motor and sensory innervation to the larynx; the cricothyroid muscle is innervated by the external laryngeal branch of the vagus, while the other intrinsic muscles are innervated by the recurrent laryngeal branch of the vagus. The cavity within the larynx comprises three consecutive chambers. 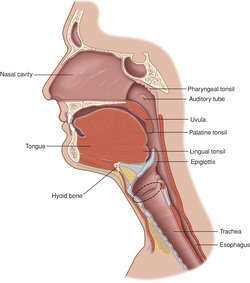 The first chamber, the vestibule of the larynx, is a tube between the pharynx and a pair of folds, the vestibular folds (the "false vocal cords"), that protrude into the larynx. The second chamber, the ventricle of the larynx, is a short segment between the vestibular folds and the vocal folds; the ventricle has lateral recesses extending laterally under the vestibular folds. The third chamber, the infraglottic cavity (infraglottic larynx, subglottic space), is a tube between the vocal folds and the trachea. An inhaled or aspirated solid object, such as a piece of meat, hard candy, safety pin, or coin, in the larynx. Any aspirated object poses an imminent risk of airway obstruction. Symptoms may include coughing, choking, dyspnea, fixed pain, or loss of voice. The ‘Adam's apple’ or voice box. The larynx is situated at the upper end of the wind-pipe (TRACHEA), just in front of the start of the gullet (OESOPHAGUS). At its inlet is a leaf-shaped flap of cartilage, the EPIGLOTTIS, that prevents entry of swallowed food. It has walls of cartilage and is lined with a moist mucous membrane and contains the vocal cords. These are two folds of the mucous membrane that can be tensed by tiny muscles to control their rate of vibration as air passes through them, and hence the pitch of the voice. 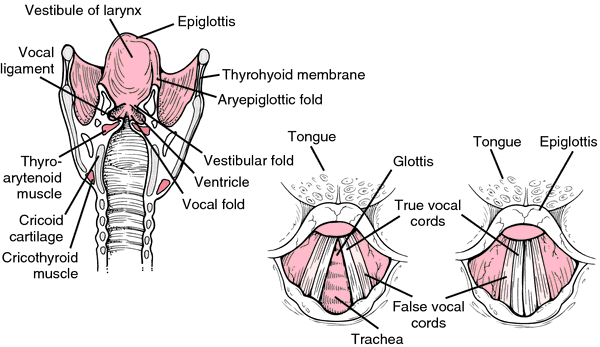 The gap between the folds is called the glottis. a dilation of the upper part of the TRACHEA of TETRAPODS (Adam's apple in humans), occurring in the front part of the neck. It is triangular in shape (base uppermost) and is made up of 9 cartilages moved by muscles. It contains the vocal cords which are elastic ligaments embedded in two folds of mucous membrane. Also known as the voice box, the larynx is composed of cartilage that contains the apparatus for voice production. This includes the vocal cords and the muscles and ligaments that move the cords. n the structure between the pharynx and the trachea that contains the vocal cords. 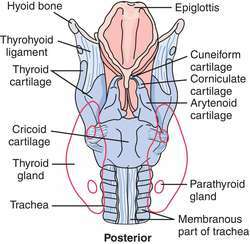 Organ of voice production; part of respiratory tract between pharynx and trachea. n the organ of voice that is part of the air passage connecting the pharynx with the trachea. pl. larynges [Gr.] the muscular and cartilaginous structure, lined with mucous membrane, situated at the cranial end of the trachea and behind the root of the tongue and the hyoid bone. The larynx contains the vocal cords, and is responsible for vocalization; it is called also the voice box. It is part of the respiratory system, and air passes through the larynx as it travels from the pharynx to the trachea and back again on its way to and from the lungs. The larynx is composed of nine cartilages (thyroid, cricoid and epiglottis, and the paired arytenoid, corniculate and cuneiform) held together by muscles and ligaments. Benign lesions of the larynx were found to be predominantly occurring in male patients (72%) as compared with female patients (28%) with the male: female ratio being 2. The larynx specimen was recovered along with tongue, hyoid bone, proximal trachea, pharynx, and proximal part of oesophagus. This cartilaginous tube being the main organ of the lungs, constitutes the basis of the vocal apparatus, and has been defined by eminent physiologists; therefore I do not think it necessary here to speak of the synthetical studies of this powerful organ of phonation; but I will add that the larynx with relation to the singing voice has two motions which we must bear in mind in connection with the timbres of the vocal sound. 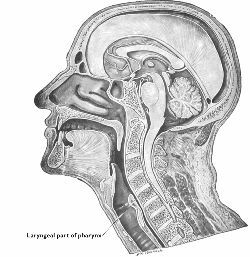 They found that this cortical area has a hierarchical and cyclical structure that exerts a split-second, symphony-like control over the tongue, jaw, larynx and lips. To understand how speech articulation works, Chang and his colleagues recorded electrical activity directly from the brains of three people undergoing brain surgery at UCSF, and used this information to determine the spatial organization of the "speech sensorimotor cortex," which controls the lips, tongue, jaw, larynx as a person speaks. KEY WORDS: Foreign body, Larynx, Direct laryngoscopy. The overall features are most consistent with giant cell tumor of the larynx. A young male singer may find the coordination for the full-voice top more easily with the larynx stabilized in the lowered position (Laryngeal stabilization eliminates the problem of the larynx raising and lowering with pitch, which is the main stumbling block in finding the full-voice top in young male voices). A Californian woman has regained her voice after a rare operation that marks only the second time surgeons have successfully performed a larynx transplant. As the diaphragm pops back up, it squeezes the lungs and pushes the air upward to another vital piece of voice equipment--the larynx (see Nuts & Bolts, right). The research aimed to study frequency and prevalence of pathological process in the larynx in patients with CCLP depending on age, duration, type and dynamics of the disease after cheilo-, urano- and veloplasty.